International Space Station Commander Chris Hadfield croons softly as he strums his guitar. His reworked version of the David Bowie classic “Space Oddity” gets millions of views on YouTube, wrapping up a highly successful mission for the Canadian astronaut. Prior to this, Hadfield was already popular due to his Twitter posts from orbit, and he worked the public and the media extensively after his return to Earth. He also published a book. Hadfield was a hit. Other astronauts have also performed for the public on their missions. But these incidents lead to some potential dilemmas. To what extent must our space travelers serve as entertainers? There has always been a need and an obligation for space travelers to connect to the public. They are mostly launched by the funding of taxpayers, and have a chance to do something that’s denied to the overwhelming majority of the human race. Expecting these privileged few to give something back to the people who made their journeys possible is understandable. They should make public appearances and do interviews for the media. Most space agencies do this with their astronauts. It’s also true that some astronauts are better at this than others. Some positively seem to cringe at the idea. Neil Armstrong was an outstanding pilot and one of the most talented people ever to command a space mission, but his aversion to the media and the public was notorious. We are now facing a major crisis for spaceflight around the world, where budgetary pressures could severely curtail human spaceflight. It is expensive, and it must fight for its slice of the fiscal pie against other Earthly projects such as health care and law enforcement. Human spaceflight (and robotic space exploration) need to sell themselves more than ever to a jaded public and government bean counters. It could be argued that performances like Hadfield’s are now more necessary to help remind the world that there is a huge Space Station above them, and it’s wonderful to have it there. But we could still go too far. If the Space Station is presented as nothing more than a weightless karaoke lounge, its more serious accomplishments could be ignored. How much light entertainment is enough? There’s another question for the astronauts. How much should we really expect of them? They work extremely hard to gain advanced qualifications in hard disciplines. They put in outstanding work as scientists, engineers, doctors and military officers. They go through rigorous selection and training for spaceflight. After this, do we really expect them all to sing and dance? 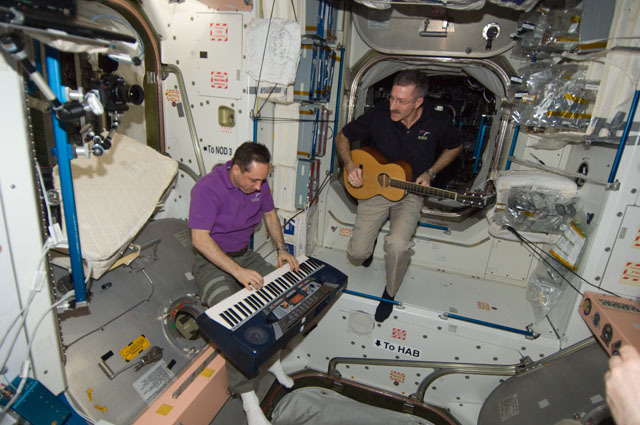 Astronaut Dan Burbank and cosmonaut Anton Shkaplerov make music on ISS in 2012 (Credits: NASA). There will probably always be a fraction of the world’s space travelers who will be willing and able to perform well in space, through music, social media, or other modes. We need them. But let’s not make this an absolute prerequisite for spaceflight. On balance, things are probably working out as well as we could expect, both in terms of what is done in space and how it is received on Earth. This is helping to promote and preserve spaceflight. Let them perform if they can, but let’s remember that it will take more than singing astronauts to keep spaceflight viable in uncertain times. Image caption: Chris Hadfield plays guitar aboard Mir in 1995 (Credits: Canadian Press/HO/CSA).